News from Gameloft about its new Terminator Salvation game, based on the movie, Ngmoco's sequel to a best-selling game, the unlikely iSperm and a game that will take you back to the days of Dragon's Lair are what tops this week's iPhone game roundup. 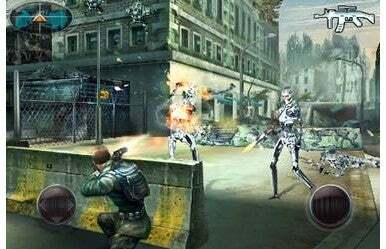 You'll have to use your iPhone or iPod touch to save humanity from Skynet and its army of Terminators come May, thanks to Gameloft. Terminator Salvation is the new action movie featuring Christian Bale, planned for release on May 22, 2009. Gameloft has announced plans to release an iPhone game based on the movie on the same day. Set in 2018, John Connor leads the human resistance against Skynet and its army of Terminators. Ngmoco has released Topple 2, a sequel to one of its first iPhone games. You must balance and stack Topple blocks using multi-touch and accelerometer controls. The game features "stack attack" in which you play against other player in real time, new modes like upside-down, balance, power tower and rescue. It costs $3. It sounds unlikely, but somehow iSperm has made it through the App Store vetting process. This arcade game has you as a single sperm cell fighting your way to an egg. It has three phases that require you to shake, tilt and multi-tap your iPhone or iPod touch. It's $1. Remember classic laserdisc arcade games like Space Ace and Dragon's Lair? Don Bluth's Banjo the Woodpile Cat is a bit like that—in fact, it's the same animators and producers as those other games. It costs $2. GeoDefense is priced at $1. It's a tower defense game with a twist—it uses retro graphics that look like they were pulled from a vector based arcade game. It sports 30 different maps and lots of different weapons, five tower types with seven levels each and more. 3-Point Skills Challeng is a $2 basketball game, arriving just in time for March madness. You can pick from one of 60 players, each based on real NBA players. Each player has a different shot rhythm, athletic ability and accuracy. There are four different play modes, and you can play with up to eight of your friends. Mathemagics is a $2 educational game that helps you learn the tricks of mental math calculation. You can play practice sessions to test your skills and then practice what you've learned through various levels of proficiency. iWire costs $1. You have to ride the wire without getting too close. The farther you can stay, the higher your score—you can get mulitipliers depending on your speed. BMW Z4 - An Expression of Joy is a free game based on BMW's Z4 Roadster. You can create drawings using the Z4 as your brush; the Z4 has been created to BMW specifications. Origin8 has released an update to Sentinel, its sci-fi-themed tower defense game. New to this release is a fast forward button, a friend challenge feature, minor bug fixes and more. It costs $5. G.I. Joyride is a $1 game in which you blaze through enemy territory in an armored personnel carrier. The game features realistic physics, performance-based story endings, and a new course each time you play. Available for a limited time for $1, Sky Force Reloaded is a vertical shooter for the iPhone. It sports 3D interactive objects, a unique soundtrack and other attributes. Eight levels, upgradable weapons, dynamic weather and high score recording. The Five Fingers Games Bundle combines five games from five different developers for $5. It includes Blackbeard's Assault, a match three game, BurnBall, in which you tilt the screen to move Roy around, Chopper, a side-scrolling helicopter game, Sneezies, a chain reaction game, and Up There, a game in which you tilt the iPhone back and forth to help your balloon escape. Sounds of Adventure is a $1 software toy for the iPhone and iPod touch that lets you produce sounds of adventuring, like cracking a whip, wielding a "laser sword," jumping on a horse and more.